Last Saturday was the “every-few-months” Montreal Math Trade, this time held at the Pub Ludique Randolphe. The turnout was excellent and the trades took place really quickly, with the whole trading taking place in under an hour for me. What is a Math Trade? Well, simply put, it’s a trade that goes beyond the usual 1-on-1 trade and instead institute a multi-participant trade, often resulting in giving items to someone who will give something else to someone else who, maybe, will give you something. It’s hard to track exactly what the result of your giving a game to someone, but it also means that the odds of getting what you want are much greater since as long as someone wants what you want and that someone else has what you want, your odds are good. At the end of the day, it’s a great occasion for me to get rid of games I don’t play much/care much about/actively dislike and get stuff that I really want or that I’m intrigued by but haven’t gotten around to purchasing. The Montreal Math Trades tend to be organized by Willy the Snitch over on Boardgamegeek and I am very thankful for that. What did I give away this time and why? And, more importantly, what new games did I get? Let’s check it out. First things first: I listed in the neighborhood of 50 different games this time around and managed to get rid of 29 titles (this includes a few extensions) and snag 15 in return. While this might seem like a bad ratio, at least they are games I’ll end up playing soon instead of having the others taking space, unplayed. I do, however, tend to be generous. I’d rather have someone else have fun with a game that I used to own than it sitting in my closet. A gricola (Z-Man Games) by Uwe Rosenberg, along with the L-Deck, the X-Deck and the Z-Deck. Why did I get rid of it? Well, apart from having the app on my iPad, I really don’t play it often enough and the last few times I played it, it had started to wear thin. I know this is almost a sin to say this, but at the end of the day, I find it dry and I find the randomness of the cards to be a killer for me. I love economic engine games, but Agricola just didn’t cut it for me. 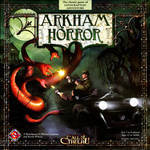 Arkham Horror (Fantasy Flight Games) by Richard Launius and Kevin Wilson. Big game with lots of bits on one of my favorite lore of all time. Seems like lots of fun, but the rulebook is a mess and since I bought it almost when it came out, it hasn’t hit the table once. Most of the game groups I play with don’t want to play since it’s can be a long game and the one group who might want to play has a copy along with all the expansions. At the end of the day, the rulebook actually turns me off and I tend to go towards its younger, sleeker brother Elder Sign when I want a hit of that sweet Lovecraftian experience. The God Kings (Compass Games) by Julien Bonnard. I really really wanted to like this game: a system that’s very similar to Hannibal but with 4 players, it held a lot of promise. The map is beautiful and the counters look pretty good too, but the scenarios… ugh, the scenarios are pretty bad. The short, intro scenarios are so bad that we didn’t end up finishing either games and the longer scenario is a little bit of a mess too and is way too long for what it is. Maybe it’ll be more to the new owner’s liking. Onward, Christian Soldiers, Men of Iron(GMT Games) by Richard Berg. Dunno, I used to love Richard Berg but lately, all of his effort seem… trite and re-hashes of games he did a long time ago. And even with some very strong developers, he seem to continue with rulebooks that are confusing, missing information and filled with asides that have little to do with the rules. Onward, Christian Soldiers is a big game with an epic feel that feels, well, flat. Men of Iron on the other hand is a much smaller game but that just didn’t grab me. I saw nothing really new in the system, even when the setting was compelling. They’ve lingered too long on my shelves, so off they went. 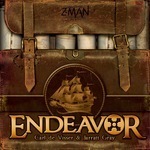 Endeavor (Z-Man Games) by Carl de Visser and Jarratt Gray. Not a bad game, just meh. It has some interesting mechanics with plenty of difficult choices to make, but it’s very dry. The theme is definitively pasted on, even with the “exploit the slaves, get some negative at the end of the game” rule. Played once and never was really tempted to bring it back to the table. At the Gates of Loyang (Z-Man Games) by Uwe Rosenberg. Oh boy. This is the third of a trilogy of games by Rosenberg along with Agricola and Le Havre (Le Havre being the best of the three, if you ask me and yes, it’s still in my collection). When Agricola came out, there was suddenly a lot of interesting in Rosenberg so that any game he put out after was instantly picked up by everyone. I have to admit being swept up in that wave and, although Loyang has that interesting mechanic where the 4 players break into two 2 player groups, there is not enough in there to keep my interest. So out it goes. 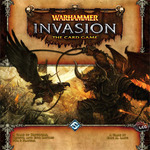 Warhammer: Invasion (Fantasy Flight Games) by Eric M. Lang, along with some expansions. I love card games and I love CCG and LCG. Problem is, and this is especially true of LCG, there are too many expansions coming out for them, it is very hard to keep up and unless you play on a regular basis, maybe too hard to do so. I’m already invested heavily in other LCGs (mainly Netrunner and Game of Thrones, although that one is getting closer to the door lately) that something had to give. I like the Warhammer universe a lot, but I prefer my cyberpunk, so out this goes. 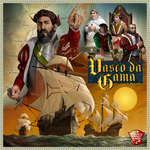 Vasco da Gama (Rio Grande Games) by Paolo Mori. I had read some reviews of this game on the web and in Spielbox magazine and it seemed interesting. An action-selection game with a neat “select when you want to play you action, but be prepared to pay for the privilege of going early. There are some meaty decisions to be made and the game seems fairly simple to teach. However, the theme, as with almost any Euros, is very pasted on. Should be interesting, even though I got the feeling that I’ve played it in the past when I was reading the rules, so maybe it wasn’t that memorable after all. Empire of the Void (Red Raven Games) by Ryan Laukat (who also did the art), along with the small Kickstarter expansion. I’ve been curious about Red Raven’s games since I saw reviews of both 8-minutes Empires and City of Iron. When I saw Empire of the Void in the Mathtrade, I didn’t hesitate. This is basically a quick-n-dirty 4X game that can be played in under two hours. The rules are somewhat confusing, even with the 1.1 rules that were released not too long ago, but once you’ve got it in motion, it seems actually fairly simple. Should scratch that itch when we want to play some 4X but don’t have the 3-4 hours needed for the big boys. 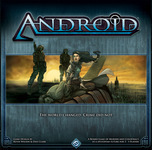 Android (Fantasy Flight Games) by Daniel Clark and Kevin Wilson. I’ve played this a few years ago and it falls squarely into the “flawed but interesting experiment” categories. Needless to say, it sold poorly but I think there is something in there, even if you need some surgery to remove the bits that are clogging the machine (as with any FFG games of a certain size, there are a lot of bits and rules to go with said bits. Too many, if you ask me). The core idea of having a murder mystery where there isn’t a pre-set murderer but is actually set during the game by the players’ actions is quite intriguing. Again (and this is getting familiar), it’s not the best rulebook, but there’s something there. Flash Duel (Sirlin Games) by David Sirlin. Ok, this is not a totally original game. Yes, it is based on En Guarde from Reiner Knizia but looks like quite a solid re-implementation. There was a bit of a todo on BGG a few years ago on whether or not Sirlin should have given credit to Knizia and I’m not sure he ever did so. The game is quite clever, however and since I own the other two games that share the same universe (Puzzle Strike and Yomi) and I love Puzzle Strike, I was very curious to see what Sirlin would do with yet another version of the fighting game theme. 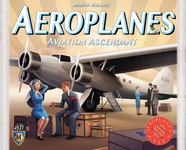 Automobile and Aeroplanes (Mayfair Games) by Martin Wallace. Well, the name on the box says it all: Martin Wallace. I hadn’t picked up these two games although I had played Automobile in the past. Love it but somehow never got around to buying it. Apparently, Automobile and Aeroplanes are related, kind of like Brass and Age of Industry, with Aeroplane being the same system, but with some refinements and some added flexibility. I love a good economic engine game and Wallace never disappoints (well, rarely… I’m looking at you, Steam Baron) in that regard. Pandemic (Z-Man Games) by Matt Leacock. I’m not a coop game fan, although I do enjoy the occasional game of Elder Sign (used to be mostly by myself, on the iPad though…) so it took a while for me to even look at Pandemic. While the theme and concept are interesting, there is always a fear of the Alpha player when it comes to coop. An Alpha player is the type that will tell all the other players what to do, so much that the game simply becomes a solo game in which other players just happen to be sitting around the table. I do hope this isn’t the case since the mechanics/theme of the game look really cool. 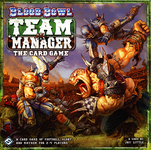 Blood Bowl Team Manager (Fantasy Flight Games) by Jason Little. As stated above, I used to be a big Games Workshop fan and an even bigger Blood Bowl fan, having all of the first three editions. I loved the game despite all its flaws: unbalanced teams; rules that seemed to contradict each other or seemed to have been badly playtested; no resemblance whatsoever to real football. I still loved it, or rather, I loved the idea of it. When I stopped buying/painting miniatures, I also stopped playing Blood Bowl. Well now I can play again, with what looks like a very thematic, very simple game of management. Rules look good (still not the best rulebook in the world, but certainly not the worst that FFG has put out) and the art is great. Should be fun. Horus Heresy (Fantasy Flight Games) by John Goodenough and Jeff Tidball. This is the Games Workshop game I’ve been wanting to play ever since I first saw Titan Legions and Space Marine: ultra-large scale battles with tons and tons of units on each side. The big battle was the Horus Heresy, when the Chaos Marines turned their backs on the Emperor and the biggest of all battles took place. Of course, it was never practical to do a recreation at the usual 40k scale, and the Epic rules were always a little dodgy. This is a big box with lots of plastic bits and a big fat manual, which I’m actually dreading. It will hit the table at some point because, well, 40k. Acquire (Avalon Hill) by Sid Sackson. Ok, so I never owned a copy of Acquire in the past and, although I love this game, I never really came close to buying a copy. Why? Because there always seemed to be a copy around that I could play or it wasn’t available at the time. This is perhaps one of the simplest, better stock market games. A little bit of luck, lots of room for clever play and simple rules that are easily explainable and understandable, it is truly a great game. And now I have my own copy. So that’s it. Lots of new games to look forward to. This entry was posted in new to me and tagged Math Trade on September 24, 2013 by TopDog.